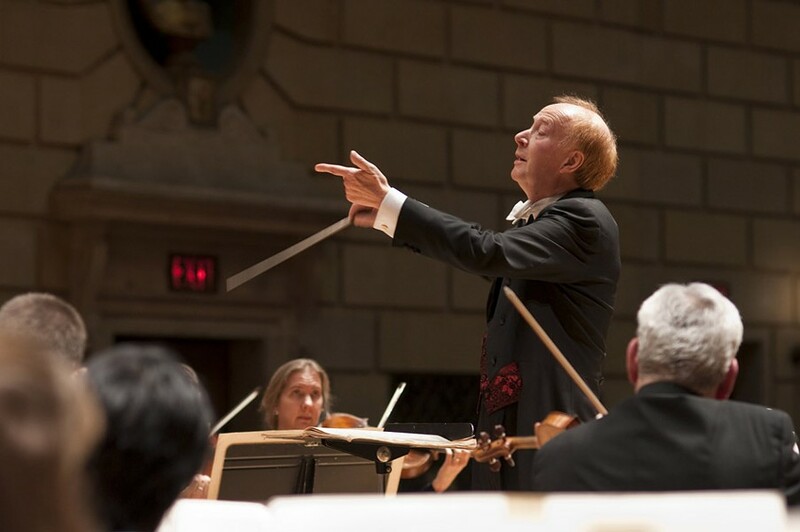 Conductor Laureate Christopher Seaman will lead the RPO and guest pianist Jon Nakamatsu through another program of Elgar, Saint-Saens, and Stravinsky on Saturday, May 2. The RPO's Conductor Laureate continues to earn his laurels. Christopher Seaman's annual visits to the podium have already become highlights of each season. He has set an agreeable habit of programming the kinds of pieces he likes best, from Mozart to Brahms and a bit beyond. This week's program was a generous serving in his way with repertoire that made Seaman so popular in the first place: a brilliant and rarely performed English tone poem; one of the most delightful of French piano concertos, with another local favorite, Jon Nakamatsu, as the soloist; and a still-startling Stravinsky ballet score. The southern location celebrated in Edward Elgar's "In the South" is Italy, that sunny country where Englishmen of a certain station have often gone to warm up their bodies and souls. Elgar, who went there with his family in 1903, was no exception, and his postcard home is a really dazzling tone poem that out-Strausses Richard Strauss and makes an ideal concert opener. Besides its brilliant writing for every section of the orchestra, "In the South" has the breadth and depth of Elgar's best music -- amid all the tumult, the most memorable section is the slow section, which features a sweetly melancholy solo for viola, which was played with winning simplicity by Melissa Matson. And nobody needs to be told how simpatico Seaman finds Elgar's music; this was an authoritative performance. Seaman was fond of presenting French music during his 13-year tenure with the RPO and had an ideal way with it, giving just the right light, lucid touch to works by Saint-Saëns, Debussy, Fauré, and other French masters. Camille Saint-Saëns wrote his G minor piano concerto in two weeks, and reportedly gave its premiere without practicing it much. Jon Nakamatsu seems to have had plenty of practice time, and gave a rip-roaring, yet elegant account of this most likeable work. Despite its occasional evocations of Bach and Beethoven, it is mostly high-gloss surface. Nakamatsu is a highly polished pianist who knows how to inject just enough passion into this delicately balanced music without making it topple. "The Firebird" is the Stravinsky ballet everybody likes, and his "Rite of Spring" has earned its bona fides in the gallery of permanent avant-garde masterpieces of music -- but I confess I find this composer's "Petrushka" as amazingly virtuosic and imaginative as either of the others. You can almost smell the vodka and the leather boots in this story of love among the marionettes who perform at a St. Petersburg fair in the 19th century. It's a tragedy, actually, as the puppet Petrushka is killed by a Blackamoor, his rival for the favors of a Ballerina; but Stravinsky's music is so extroverted and so detailed that a performance of the entire ballet score is exhilarating rather than disturbing, in fact it is one of the most dazzlingly kinetic works in the orchestral repertory. It seems to be a favorite of Seaman's; he conducted it with the RPO at least twice before, and it was a treat to hear it for a third. Conductor and orchestra savored all of Stravinsky's garish colors, boisterous humor, and splintered rhythms, with a particularly vivid rendering of the string of folk-based dances in the final tableau. Stravinsky's orchestration remains arrestingly brilliant, even in this 1947 slimming-down of the score. Every section gets a workout, and there was standout solo work from pianist Joseph Werner (who "plays" Petrushka) and trumpeter Douglas Prosser. At the conclusion of "Petrushka," Seaman expressed his desire not to leave the audience "holding a dead puppet" and swung the orchestra into an encore. I will not disclose it and possibly spoil Saturday night's surprise, but it was a lollipop from another Russian ballet, and it sent the audience out humming. It also found the orchestra members playing wreathed in smiles -- and how often do you see that?